Kate and Rob had a beautiful wedding. The ceremony, reception, and idle were at the Columns Banquets in Elma, NY. Both of them also got ready there. 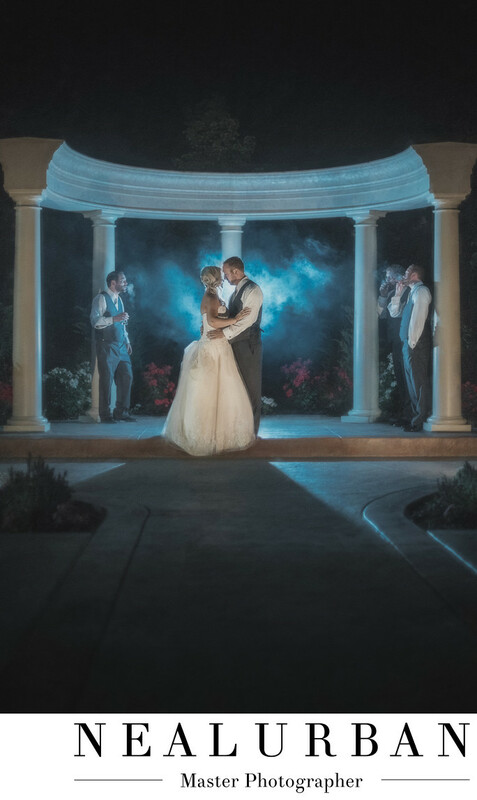 They had their ceremony in the outdoor courtyard. Family portraits were taken right after and everyone went over to cocktail hour on the patio. We took the wedding party for photos around the grounds. During the reception, we always like to take the bride and groom out for one last photo session. We talk with the dj, band, or wedding coordinator to make sure they will not miss anything. We normally only have them for about five minutes. We make sure we know exactly where we are going and all of the lighting is ready to go. Want want to get the couple back into their dance party! Kate and Rob had a cigar rolling station on the outside patio. A man was rolling fresh cigars for the guests. This is always a favorite for the guys. Neal asked two of the groomsmen if they could assist us with a photo of the bride and groom. We needed them to smoke their cigars. We had a flash behind Kate and Rob. This was going to give nice back light, but also create an effect to see the cigar smoke. We wanted it to be a cool blue color. Normally, the groomsmen would have been photoshopped out of the image, and just leave the newlyweds. This looked really cool with the guys still in it. They look like they were hanging out at the columns first, and we invaded with the bride and groom. Neal Urban really like effects with smoke. When there are cigars he always tries to come up with a cool shot. When there are sparkler send offs at the end of the night, we love the after effect images with the smoke! Location: 2221 Transit Rd Elma NY 14059.